Cado's diversity makes it stronger. In our case, that diversity comes in the form of Union Products and Fantazia Marketing. Originally three companies, we are now one: delivering product solutions to make your company strong, as well. 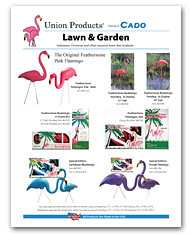 Union Products is a local success story that produced the famous Pink Flamingo lawn ornament. Fantazia novelty products, such as the Giant Crayon bank, are found at well-known retailers nationwide. 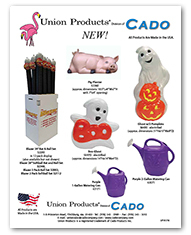 Union Products, acquired by Cado Company in the late 2000s, is a trusted manufacturer of quality lawn and garden decorative items, such as urns, animal planters, bird baths, strawberry pots and watering cans. But it’s the Pink Flamingo — developed in 1957 by the company’s president at the time, Don Featherstone, that truly put the company on the map. The fact that a tropical bird that went on to grace thousands and thousands of yards was actually invented in sometimes-chilly New England merely added to the story’s charm. 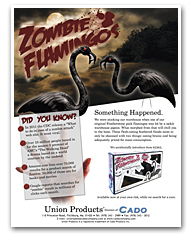 Today, the Featherstone Pink Flamingo has modern-day companions, such as the Special Edition Caribbean Blue Flamingo, Special Edition Featherstone Snomingo, Zombie Flamingo, and the larger Realmingo. And though the company is famous for the beloved birds, it’s also a large producer of planters: swans, frogs, lambs, conch shells, cauldrons and kettles décor items: geese, penguins, Easter eggs, watering cans: 2 gallon, 1 gallon, elephants, frogs and pig watering cans, bird baths: Victorian, standard round and the new Daisy bird bath. 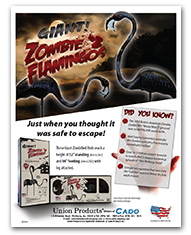 Union Products items can be found in many hardware stores, gift shops and retailers in the USA and abroad. 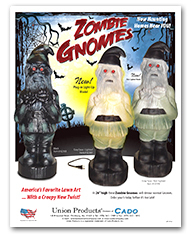 Union Classic Christmas Lawn Decorations are back after being out of production since 2005. Classic favorites such as Santa Claus, Mrs. Claus, Snowman, Gingerbread & more! Union also produces the largest Halloween cauldron at 22” in diameter and all of Union’s cauldrons are manufactured with no hole in the bottom, allowing for many more uses than other cauldrons in the marketplace. 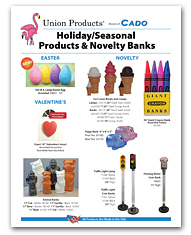 Union rounds out its seasonal offerings with products for Valentines, Easter and St. Patrick’s Day! 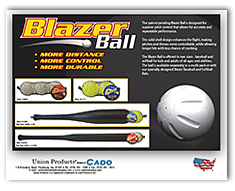 Fantazia Marketing was also acquired by Cado Company in the late 2000s. The company also makes novelty items and gadgets you won’t find anywhere else, such as ice cream cone banks, baby bottle banks, Giant Crayon banks, piggy banks, traffic lights, traffic light banks, flower lights, flower banks, stop lights and stop sign banks. Fantazia provides unique gift solutions and its products are distributed to online and brick-and-mortar stores across the U.S.